We have often been asked by people what they should expect at their first counselling session so we thought it would be a good idea to make this information available as an audio file. This is now available on our FAQ page. As well as listening to the file on our website you can also download the audio file to listen to later on your own MP3 player. Next week is Mental Health Awareness Week, an event which seeks to raise awareness of mental health and wellbeing issues. Each year brings focus to a different topic and this year the theme is Mindfulness. 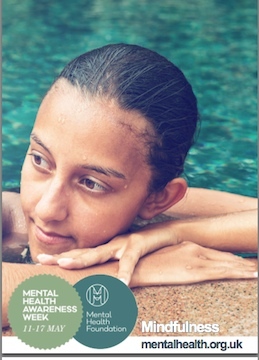 You can learn more about Mindfulness as well as finding links to online courses and podcasts by downloading this brochure from the Mental Health Foundation. You can bring Mindfulness into many of your daily activities such as walking or taking a bath. It can help you in the way you react to stressful situations and is a valuable tool to help you stay mentally healthy. In fact studies have shown that mindfulness can help reduce anxiety, depression and stress. A 2013 study led by Oxford University students showed that mindfulness study produced reductions in anxiety, depression and stress. This week sees the launch of the first ever Children’s Mental Health Week. This campaign seeks to raise awareness of this issue and show the benefits of providing children with support at an early stage. The event, which is organised by national charity Place2Be, was launched earlier this week by the charity’s patron the Duchess of Cambridge. If you want to find out more about this issue we have an article on child and adolescent counselling on our website and we have counsellors with many years experience in this field. In Search of Ourselves Presented by Martin Sixsmith BBC Radio 4. From ancient times, humankind has sought to understand what makes us think, feel and act the way we do. In this series, Martin Sixsmith charts the path from early beliefs to the birth of modern psychology in the late nineteenth century, the splits and controversies of the twentieth century and today’s democratisation of psychological care.